1 of 6 Cream butter and 1/2 cup of the sugar in a large bowl with an electric mixer on medium high until fluffy. Add egg yolk and vanilla; beat until incorporated, scraping down side of bowl as needed. Add flour and mix on low speed until dough comes together in a ball. 3 of 6 Heat oven to 375 F. Line baking sheets with parchment paper. 4 of 6 Process candies in a food processor until finely ground. Transfer to a small bowl. 6 of 6 Using a very small spoon, carefully fill each star cutout with candy so it is resting on the parchment paper and is level with the dough (1/4 to 1/2 teaspoon in each). 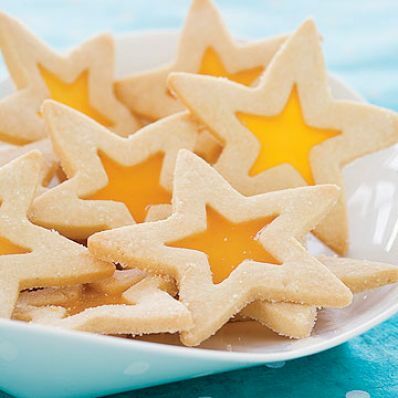 Sprinkle cookies with some of the remaining 1/4 cup sugar. Bake at 375 F until cookies are firm and golden, about 8 minutes (a minute or two longer for frozen dough). Cool completely on the baking sheets. Repeat with the remaining dough, then chilled scraps, using fresh parchment each time. Keep at room temperature in an airtight container for several days.